The BARC received a grant from ConocoPhillips. The funds from that grant were used to upgrade three of the club repeaters. The BARC formed a Repeater Committee consisting of Bob Buford W5RAB, David Balli KX5I, Al Fromm AL7C, Andrew McCullough KE5WPH and Don Poquette KE9XB, to plan and implement the upgrade project. 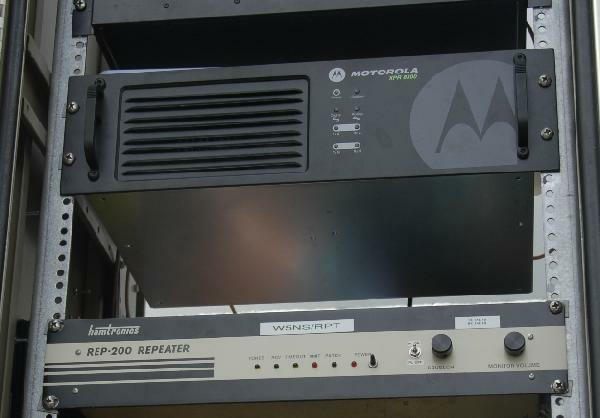 The committee evaluated several options and chose to purchase two Motorola MotoTRBO XPR 8300 repeaters from Muskogee Communications at a discounted price. One repeater was to replace the aging 146.655 MHz VHF repeater and the other was to get the 444.775 MHz UHF repeater back on the air. Figure 2: Close up view of the 146.655 repeater in the rack. Both repeaters bring the club into the digital age by being able to transmit and receive both analog and digital signals. The repeaters can be networked onto the Internet and accessed any where in the world for voice communications. At this time the digital and network functionality are disabled on both repeaters. The 444.775 MHz UHF repeater was installed at a central location to give the best coverage for the town and outlying areas. 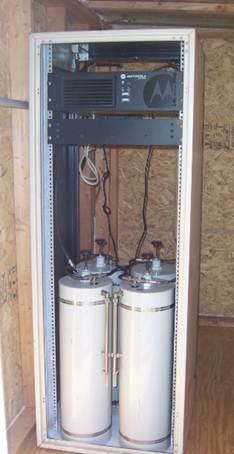 The repeater is housed in a cabinet that has a battery backup and power from a backup generator. A new hardline coax cable and antenna were put in place to complete the installation. The club secondary 146.760 MHz VHF repeater is collocated in the same cabinet with the 444.775 repeater. Some of the upgrades to the 146.760 repeater include new duplexers and a new PL tone circuit board. The 146.760 repeater is a Hamtronics model. Figure 3: Close up view of the 146.760 and 444.775 repeaters in the rack. The club primary VHF repeater was installed at the existing 146.655 site. A new 8’x5’ building was built by club volunteers to house the repeater rack. The repeater has a natural gas burning generator for backup power. The repeater has a wide area of coverage. Signal reports indicate that the repeater is working as well or better than the old repeater. Figure 4: The 146.655 repeater in the rack in the new 8’x5’ building.